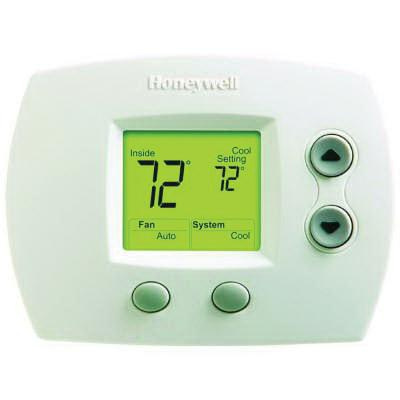 Honeywell FocusPRO® Heating and cooling thermostat in premier white color, is rated at 20 - 30-Volt AC. It measures 4-1/2-Inch x 1-5/16-Inch x 3-7/16-Inch. This horizontal mountable thermostat has 40 - 90 deg F heating and 50 - 99 deg F cooling setting range. Thermostat has 1.95-Sq-Inch display for easy reading. It is suitable for 1 heat/1 cool conventional systems and heat pumps with no auxiliary heat.